This set of berms is a little different than what most shooters have used or seen on other ranges. The private berms come in two sizes. One is 30 feet wide by 130 feet deep and the other is about 16 feet wide by 130 feet deep. There will be 12 total when the range is finished. Each berm will have a 20 foot back stop and walls on each side of 8 feet in height. There will be 12 total when the range is finished. Each berm will have a 20 foot back stop and walls on each side of 8 feet in height. Each one will have a large table, a bench and a stool which the member can move to where they want and leave them there. All type of targets can be shot here but no glass, explosives or incendiary’s of any kind. 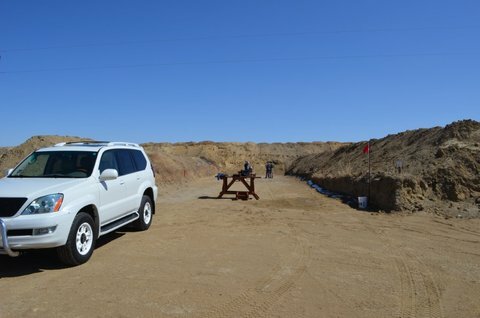 The 30 foot range can be used for a variety of action shooting competitions. All of these berms can be used by any member during hours of operation to shoot pistol, rifle, and shotgun. When a member enters a berm they will be in control of that berm and only they will be shooting on it. They will raise the flag and set their targets to the back stop and then walk back from the target to the distance that they wish to shoot. This type of berm is like shooting in your own back yard.